BEST TIME TO VISIT: ? COMMENTS:? Only some rocks and depressions in the farm land remain as evidence that one could buy a hat, rent a room, council with a lawyer, eat a meal, or buy a drink in a little town called DeVoe. If you could walk across the pasture land a few miles north you would see that there is a spot where the grass grows a little differently. This is all that remains to mark the spot, never plowed, where a claim shanty stood. Go back with me to the spring of 1883. The baby girl is asleep and the little boys, about three and five have been sent to a small country store for coal oil and shoe blackening. This store was soon to close because plans to establish a post office never materialized. The family, Mr. and Mrs. Alex Miller, Bert, Hal and Sadie have come, first to Northville and later to their claim, mainly to find relief for the young mother’s asthma. They were not the first settlers of Dakota Territory, but came at a time when many claim shanties were being built on land that was available as a homestead, a pre-emption, or a tree claim. These were rapidly changing times with dwellings and town sites appearing to dot the flat, flat prairie, and then disappearing as many of the people shifted to other localities. All is quiet in the little claim shanty and she, who came to this Dakota Territory from a lush farming region of Missouri, sits down to pen a letter to her brother. We have moved out on our pre-emption near the first of May. We are about 20 miles from Northville, but the country round about is settled up and all the way from here to the Missouri River people are squatting on the land. This is pretty country, high and dry, and I guess it will make a good country to raise wheat and horses. There is a business like little town called DeVoe some three miles south of us on the Nixon River. There is a P.O. there, but we will continue to get our mail from Northville this summer as we go there for the bulk of our supplies. The railroad was an important factor in the building of the many small towns across Dakota at this time of the sudden influx of settlers who were seeking new land and new homes. In the early 1880’s it had been rumored that a railroad was to come through this area and the little town of DeVoe sprang up in anticipation of it. The town site was Faulk County, Township 119, Range 67 along the road between sections 26 and 27. Mr. J. H. DeVoe, an early settler came in 1882 and the town was named after him. At one time a hotel – The Abbot House, a blacksmith shop, millinery shop. Post office, land office, lawyer’s office and a saloon were located there. A grocery and general store on the west side of the road was operated by Chauncey Cooper for many years. There were no other stores nearby and it was a long trip to either Northville or Faulkton the nearest railroad towns. The early stores carried merchandise that the settlers were likely to need in their pioneer living. According to Mina Miller and Margaret Holm, who can remember shopping in DeVoe, it was possible to purchase yard goods for a new dress, the choice was limited to a few pieces of calico, or one could buy any of the staple grocery items – flour, sugar and canned goods. Also available were mittens, and Arctics (two-buckle overshoes) and high up on the shelves, among other things, were lanterns and straw hats. Of course the penny, stick candy was the most interesting part of the trip to the store. Mr. and Mrs. George Brown took over the grocery in later years. Maintaining the post office was part of the work of the store keeper, mail being brought by team and buggy from Athol. Families in the area came to get their weekly news papers and to perhaps trade out their butter and eggs for groceries. The Coopers, who had three sons lived in the store building as did the George Browns at first. Later the Brows built the house now occupied by Duane Bisbees and closed out their store. For a time in the early 1900’s the post office was operated from the A. B. Clifford home. Then a group of neighbors helped Charley Kenny fix up a building with a grocery store and post office. Across from it on the west side of the road was the school house. He bought supplies overland from Northville. He bought eggs and cream from the farmers around and maintained the post office until it was discontinued. I remember hearing my folks talk about Rev. Knox preaching at DeVoe. In the fall of 1882 Rev. P. E. Knox of Wisconsin left home by rail to Athol, Dakota Territory to look for a new home and look over the free land that was open for settlement under the Homestead Act. My grandfather, Thomas Purcell, from Illinois was on the same train, bound on the same errand. They met and became good friends and both took up land at DeVoe just a few miles apart and built homes there. The Knox family moved into their home in 1883. Rev. Knox had the distinction of organizing the first church in Faulk County, preaching the first funeral sermon and marrying the first couple. He was the minister who married my mother and father, Mercedes Ann Purcell and William Jackman. A number of the early settlers were church minded people and from a letter written by the daughter of Rev. P. E. Knox, Elizabeth Knox McMeekin, we learn more about this part of the life among these pioneering people. 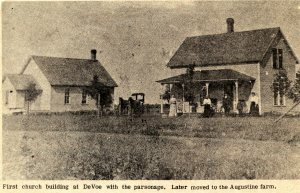 The first Sunday School in DeVoe was organized in the winter of 1882-1883 by four young men who were squatting on claims in that neighborhood. They were Robert Young, Mr. Foote, Mr. Jessup and Chauncey Cooper. Rev. P. E. Knox and family came to Dakota in 1883 and he organized the church that summer. There had been a saloon in DeVoe but the proprietor grew weary of looking for customers who never came and he moved away leaving an empty building in which services were held for a while. During the summer of ’83 the hotel, The Abbot House, was built and then the church and Sunday School were held there. In the fall of 1885 the new church was started. On election day Mary Young and Elizabeth Knox took subscriptions at the hotel where the election was being held and almost all of the required amount was raised. On Christmas Eve an entertainment was held in the new church. This was a temperance play called “Three Glasses a Day.” Leading parts were taken by Elizabeth Knox and W. R. Davis. This was the first time the church was occupied. Following the play, there was a dinner at the hotel. After this all services were held in the church and when it was dedicated in August 1886 it was fully paid for. 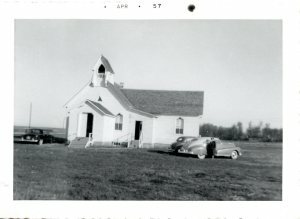 Additional documentation of the beginning of the church organization is found in a letter written for the 75th anniversary of the DeVoe Church. Miss Bell Jarvis tells of her first recollections when she came to this community with her parents in 1884. The first I remember hearing of a church to be built at DeVoe there was a meeting at the hotel and we went. All I can remember was the folks talking about the wonderful baskets of lunch my mother took for that supper. We had just moved from eastern Minnesota and she had plenty of vegetables for pickles and fruit for jam. Most people had lived here long enough that theirs was gone. We gain a little insight into the lives of the early settlers who lived around DeVoe from a letter written by Ada Davis Pinkham on Sept. 23, 1933. My mother and father were W. R. Davis and we lived on a farm four miles east of DeVoe and every Sunday, summer or winter, we hitched up in the light wagon or the sled and took the trip to DeVoe. My father prided himself on being on time and so we did our Sunday morning chores and often arrived at the church before anyone else. Unfortunately my memory does not go back to the summer of 1883 when we arrived to begin homestead life in part of a sod barn, nor can I remember anything about services until the church was being built. My first impression of it goes back to the time when the framework was all up, the tar paper was covering the sides and the window frames were not in place. The one memory in this black tar paper covered building was my cousin Eddie Jones, a boy of possibly sixteen accompanied by a crowd of boyfriends, jumping in and out of the openings where windows later were placed. From that first impression my memory flits about recalling the wonderful Christmas celebrations when we all spoke pieces. I also remember Children’s Day and the Sunday School picnic and other similar grand times when the stern duties of life gave way to the happier social side of life which made pioneering endurable in those days when luxuries and comforts were very few. Even now I recall the bitter disappointment Margie and I experienced on Christmas eve at the so called Christmas Tree (which was nothing more than a clothes basket on the rostrum filled with gifts) we spied two bright red hand sleds and felt sure they were for us, but instead, we felt by mistake, they went to Matt and Hall Jarvis. Well I do remember having to go through a severe scrubbing process Saturday nights and then in the summer our problem was not easy for we went to Sunday School bare footed and had to be clean as our limited supply of water could make us. Our little Sunday School class was grouped about in the corner where the organ stood, and Mrs. Alex Miller was our teacher. …No community ever really appreciated its blessings and enjoyed its friends and neighbors more than did that little community back in the ‘80s. Some wonderful people cast their lot in those days and laid the foundation for a fine family and community life. An early resident of this area, Mrs. A. B. Clifford tells some interesting recollections at the 50th anniversary and here are some quotes from her written report. The church was built on the east side of the road at the site of DeVoe was dedicated in 1886 but it was not just plastered. Mr. and Mrs. Alex Miller and family moved here in 1883 and before the church building was completed they took up their place in the church and gave freely of their time and money. Mrs. Miller once said, “I can more easily pay this salary myself but I know others want to help.” So she drove old “Julie” from home to home collecting needed money. Mr. O. L. Stone and wife came here about this time and were each active in church and Sunday School work, each being Supt. of the S. S. at different times. Mrs. Stone sang in an early choir which also included W. R. Davis, Robert and Mary Young, Ida, Amy, and Elizabeth Knox, Ed Calkins, Mrs. Cooper, the Butterfields, and the Howes and Shults. Fourteen years after the first religious organization at DeVoe and after most business places had been abandoned, the DeVoe church was to build a parsonage so that a minister and his family could reside there. From Rev. R. L. DeGolier’s report to the quarterly conference, January 18, 1896 we learn some of the problems facing a preacher during pioneer days at DeVoe. The minister had a circuit out from DeVoe which included the outpoints of Roanoke, Grabinski and Eatondale where church services were probably held in school houses. In the previous meeting the minister’s salary was considered and it was decided that he should receive $400 or its cash value. In Rev. DeGolier’s own words he tells of his trials and his disappointments as he began his ministry in DeVoe. He also tells of his faith and his hope for the future, which was a necessary attitude in the minds of all those who chose to inhabit this part of the mid-west in those earlier days. After hearing the appointments read, thought began to arise in my mind (which is perfectly natural) as to the whys and wherefores of my being sent (seeing I had a family to look after) to a place where there was no parsonage or house to rent where I could send the children to school and I must say I felt somewhat disheartened, but never the less the next Sat. myself and wife started for DeVoe to see what we could find and try and make up our minds why it was thus. On arriving we found an old building and a lot of old lumber all together with a stone wall laid 16 X 26 and 8 X 16 with a cellar 10 X 12 called a parsonage. So that we concluded that one reason was because a carpenter was needed and taking this for granted the following Tues. 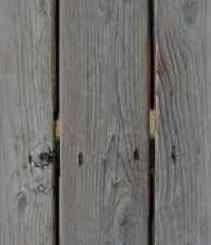 I took my chest of tools on the buggy and went to work picking out and fitting together, the lumber that had been previously gathered up with some $55 worth of new. I did not expect it would be very long until we could move. The only help I received from the DeVoe church was two loads of lumber hauled and a man to help some while plastering (Father Williams excepted). The ladies who helped deserve a great deal of credit. As sister Simmons said at the conference, “According to appearance there will not be men enough in heaven to sing bass…”. I kept at the work as best I could and as a result we have at DeVoe a good comfortable parsonage which we believe when finished will compare favorably with any in the District, with about $20 indebtedness. So until the last week I have not been able to read or study, much less attend to my pastoral work. Our congregations are good at DeVoe and we hope to be able, by the aid of the Holy Spirit to get everyone at work and save the community. “Father Williams” was one of the early ministers serving DeVoe from 1892 to 1895 before there was a parsonage. Hugh Miller, fourth child of the Alexander Millers and a native of the area because he was born November 17, 1884 when the town of DeVoe existed and Dakota was still a Territory, writes from Simi, California in 1960 about the first preacher he can recall, J. B. Williams. In order to have a preacher for what little salary the church could pay, Mother gave Grandpa Williams a home at our place. As far back as I can remember the little bedroom in the northeast corner of our house was called “The preacher’s bedroom.” Grandpa Williams was a good man white haired, tall, straight and of course I thought awfully old. Maybe he seemed older because of his occasional epileptic spells. If he started to pull the table cloth, it was hurry to get him a drink of water and get him to lie down. I recall only one spell in church when he spilled the Bible and song books from the pulpit onto the floor before anyone could go to his help. I recall that he made the first pulpit from the wood of a couple of old organs. Rev. Bromaghim preached at DeVoe from 1902 to 1915 and he and his family lived in the parsonage those thirteen years. With the coming of the M & St. L railroad the town of Cresbard came into being several miles north. While still living at DeVoe Rev. F. L. Bromaghim preached in the new church at Cresbard for a couple of years. Since the rumor of a railroad coming through DeVoe never materialized the business-like little town quickly began to disappear. By the time that the Bromaghims lived there all that remained was a school house, Kenny’s store, the church and parsonage. The intervening years from his pastorate to the present time are another story which is not included here. The only building left at the DeVoe site is a church which is maintained as a community building and used occasionally for social gatherings. In mute memory of the past the cemetery retains the name as do the maps of Faulk County because the township, from which this story evolves, is known as DeVoe.